Family Friendly Travel News & Reviews! TRAVEL APPSTravel applications for iOS, Android and Windows devices. Bringing you useful travel applications that will make your journey easier and more efficient. 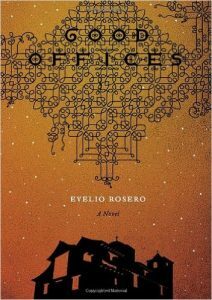 Five Colombian Novels you MUST Read! Take a look at these MUST read Colombian books! From the magical realsim of Nobel Laureate Gabriel García Márquez, to the ‘report style’ of Laura Restrepo. Colombia has a wide and varied history of literature, across many spectrums and styles. Here we choose a varied cross section of the best five….that in our humble opinion….you MUST read. All five books are available to buy in their original Spanish format, as well as English language translations. ‘s masterpiece. This widely acclaimed novel is considered one of the most significant Spanish language pieces ever written. The story centres on the mythical town of Macondo. A town founded by José Arcadio Buendía, whose family and decedents are central to the story. 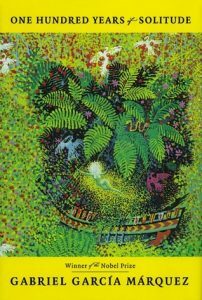 Macondo is a metaphor for Colombia from it inception. Plays out 100 years of its troubled history. Gabo uses bizarre, surreal and magical literary vehicles to confound and inspire the reader on this bumpy journey. I cant guarantee you will like this book. It takes a reader with particular tastes (magical realism is not for everyone), and a lot of patience to fully appreciate it. The story travels at break neck speed, never lingering to give the reader respite. It can also be a draining read, but the sense of achievement is worth the effort. A struggling unemployed professor, Aguilar, returns home to find is beloved wife, Augustina, suffering from an unexplained psychosis. By exploring the minds of four central characters, the book plays out a detective-love mystery. As Aguilar struggles to find answers to Augustina’s Delrium. Very complex and deep, it will consume the reader. You should let it. The book has all the hallmarks of a Colombian classic, and is very well written. 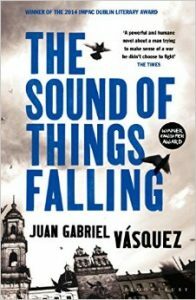 Set in Bogota in the 1980’s, the book has all the elements of the countries political struggle at that time. 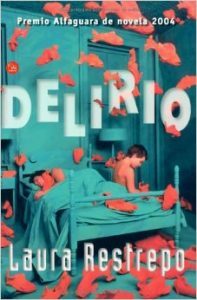 Restrepo has defined her own work as a ‘report-style’ of writing. A style crafted and moulded from a previous life as a politician and journalist. Restrepo was part of the commission tasked with negotiating peace with the M-19 guerrillas. Natasha Wimmer translated the book in 2007. The book is set at the height of the Colombian drug wars in the 1990’s. Skipping back to the past to further the story when required. It shows how the drug cartels dominance of Colombian life, impinged on the lives of everyday normal folk. Highlighting profound and tragic effects on all avenues of society. The story follows two Colombians in Bogota, Ricardo and Maya, as they are drawn together. As recent and past tragedies are played out for the reader. This political thriller is sure to keep you absorbed from start to finish. A haunting window into the lives of Colombians, during those torrid times. Anne McClean translated the book into English in 2013. For which it won the prestigious International IMPAC Dublin Literary Award. We went for Good Offices over Roseros slightly more famous The Armies. We consider is a masterful piece of satire on the Catholic church. This thought provoking novel, tells how a mysterious drunken priest steps in to perform weekly mass over a peculiar procession. In convincing them all to drink with him in the meal that follows. The long night ahead reveals a people plagued by hypocrisy. Rosero takes a swipe at how the Catholic church, and Colombian society intertwine. Casting light on the often ludicrous hypocritical nature of the relationship. A relatively short novel, that gets better and better with every page. Another Anne Mclean Translation, in collaboration with Anna Milsom. Not a widely popular book, but does have a dedicated cult following. The Author Andrés Caicedo, was an influential cultural intellect in 1970’s Cali. The dominant body of his work consisted of playwrights and short stories. But Live Forever is considered one of his most important and original works. 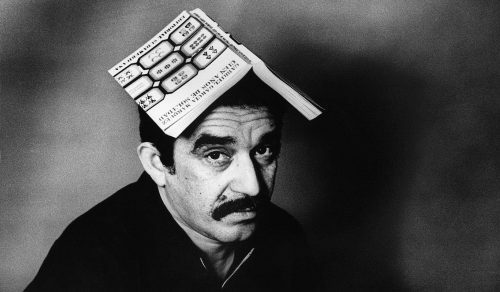 It was on the books day of publication, on March the 4th 1977, that Caicedo took his own life at the age of 25 years old. 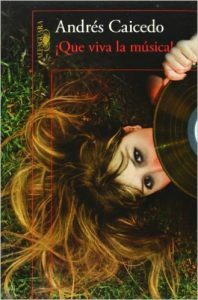 The book tells the story of a young woman, María del Carmen Huerta, in 1970s Cali. Stuck in a endless loop of hedonistic debauchery. Travelling between social groups to reveal her darkest fantasies. It is an incredible social piece on the ‘Capital de la Salsa’ at that time. Caicedo reveals the city in a magical wallowing atmosphere. We love this book immensely, and we hope you will too. Frank Wynnes translated the novel into English only recently in 2014. Five Incredible books for you to begin reading. We will be back with more literature reviews soon! Enter your email address to subscribe to Travel Mono and receive notifications of new posts by email.